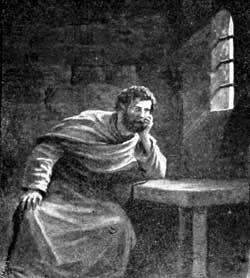 Paul remains as a prisoner in Rome. HEN THE SPRING days returned the Roman centurion, Julius, placed his soldiers and prisoners on board a vessel that had lain all winter in a harbor of the Island. This vessel was bound for Italy and would take its passengers to the end of their journey by sea. The remaining distance to Rome they would travel by land. Paul's two friends, Luke and Aristarchus, continued the journey with him from the island. When the ship was ready to leave the harbor, the kind-hearted natives brought gifts of necessary things to these Christian men who had taught them about the Lord. In this way they tried to show how glad they were that these men had come to them. A city called Puteoli, in Italy, was the last stopping-place of the ship. Here all the passengers landed, and those going to Rome made ready to start on the last stretch of their journey. In this city some Christians were living, and they were glad to see Paul and his friends. The Roman centurion allowed Paul to remain with these Christians for one week. The journey from Puteoli to Rome was made on foot, over a well-built highway. As Paul trudged along the road his heart felt sad. Perhaps he feared that he might not have many opportunities to preach the gospel because he was a prisoner. Perhaps he thought that only a few people would be willing to listen to the words of a strange preacher who was bound with a heavy chain. But there were some Christians living in Rome also. Paul had never met these Christians, although he had written a long letter to them before he had been captured by the Jews. In that letter he had told them of his desire to visit Rome and to preach the gospel there also. When these Roman Christians heard of Paul's coming, they were very glad. Some of them started down the highway to meet him. Even though he was a prisoner they were happy to welcome such a good man to their city. And when they met the company of dusty travelers from Puteoli, they eagerly inquired for Paul. The coming of these Christians encouraged Paul very much. The sad feelings now left him and he thanked God for bringing him thus far on his long journey to Rome. He knew that he should have true friends in this strange city, friends who would not be ashamed of him even though he wore a chain. Julius, the centurion, gave his prisoners into the keeping of the captain of the guard of Rome. No doubt he told his captain about Paul, the prisoner who did not deserve to wear a chain, for the captain looked kindly upon Paul and did not cast him into the dreary prison but allowed him to live in a hired house. He could not take off the heavy chain Paul wore, for he did not have authority to do that. And always a soldier stayed with Paul to guard him as a prisoner. For two years he lived in his hired house, with first one and then another soldier with him, and these men learned from him the story of Jesus. Not only was Paul allowed to preach the gospel to the soldiers, but any one who wished might come to see him. When he had been in Rome only three days he sent for the chief Jews who lived in that city. They came to him, and he told them how the Jews in Jerusalem had accused him of wrong-doing and had caused him to be bound with that chain. He explained why he had become displeased with him. These Jews in Rome had heard nothing about Paul. They had received no letters from their friends in Jerusalem, accusing him of wrong-doing. But now they asked him to speak to them about the new religion that had so greatly displeased their people in the homeland. And Paul gladly consented to do this. On the day which they had appointed many Jews who lived in Rome came to Paul's lodging to hear him tell the gospel story. For a long time they had heard about the Christians, but never had they heard the teachings of the new religion. And always they heard unkind remarks about those who believed in Jesus. Paul took the books of Scripture, which they knew and love--the writing of Moses and of the prophets--and he explained how Jesus came to earth, suffered, died on the cross for the sins of men, and rose from the dead, all in fulfillment of the Scriptures, which spoke of his coming. While Paul talked, the Jews listened carefully. Some of them believed his words, and they were very glad to hear that God's promised gift to men had really come. But many other shook their heads and said, "We do not believe this teaching." When Paul saw that many would not believe he said, "It is just as the Holy Spirit spoke by the prophet Isaiah, saying, 'The heart of this people has grown hard, and their ears will not hear my words.' But the Gentiles," said Paul, "will hear and believe the salvation which God has sent to all men." As a prisoner in Rome, Paul taught many people about Jesus. He also wrote letters to the Christians who lived in other cities where he had preached. Some of these letters we have today in our Bibles. They are called epistles. One day while in Rome, Paul chanced to meet with a runaway slave, named Onesimus. This runaway belonged to a man who lived in Colosse, in Asia Minor, and who was a Christian and a friend of Paul's. Many people in those days owned slaves, just as farmers now own horses and cattle and sheep. They bought and sold these slaves, men, women, and children, just as people buy animals today. But Onesimus had run away from his master, and had come all the long distance to Rome. Paul talked kindly to this runaway, and finally he helped Onesimus to find God. How happy this poor slave became when he knew the joy of salvation brings! He longed to stay with Paul and to learn more about Jesus. He liked to do acts of kindness for this chained prisoner who had done so much for him. But Onesimus knew he belonged to Philemon, who lived in Colosse, and from whom he had run away, so he decided to return again to his master. Paul loved this slave who had become a Christian. He knew how cruelly the law treated runaway slaves when they were captured; but he believed that Philemon would not treat Onesimus so unkindly. He wrote a letter to Philemon and sent it by Onesimus. In this letter he told Philemon about the helpful deeds this slave had done for him since they had met in Rome. He urged Philemon to welcome Onesimus as brother, not as a wicked runaway, for God had saved him from his sins and now he, too, was a Christian. This letter to Philemon we have in our Bibles. Onesimus also delivered the letter Paul wrote to the church at Colosse, ant that letter we have in our Bibles, too. The Acts of the Apostles does not tell us any more about Paul, nor about the other apostles. But history tells us that Paul was finally killed by the wicked Nero, who was ruler of Rome. Not long before Paul was killed he wrote a letter to Timothy, the young man whom he loved as his own son. In this letter he said that soon he must die. He did not seem discouraged, but rejoiced because he had worked faithfully for God. And he said, "I am now ready to be offered." He told Timothy that a crown of righteousness was waiting for him in heaven, and not only for him but for every one who loves the Lord and desires to see him. This beautiful letter is also in our Bibles, and the words Paul wrote to Timothy encourage every Christian who reads them.